Anyone intent on visiting the indomitable Tarkine Wilderness in the far reaches of northwest Tasmania should whet his or her appetite at the Whyte Hills Lookout. Looking over the far northwest portion of the wilderness, the Whyte Hills Lookout provides a safe viewing platform and informational displays to teach you about one of the wildest reaches of the island. 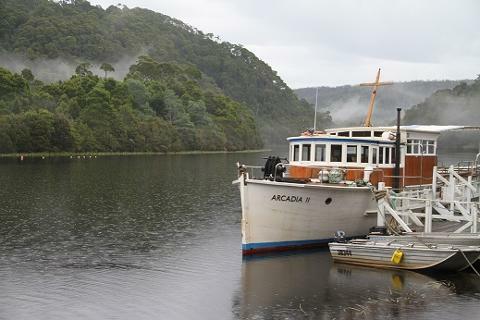 You'll be able to drink in the stunning views of the largest area of temperate rainforest in Australia. The platform brings you high above the rainforest which stretches as far as the eye can see. You'll also be able to peer down into the Arthur River as it cuts its valleys into the Tarkine. The platform is easily accessible from a carpark, and is a great way to stretch your legs and get a feel for the immensity of the Tarkine. The lookout is just 1 kilometre from Philosopher Falls in Waratah. Take B23 west out of Waratah for about 10 kilometres before turning right onto Butler Road. The carpark is just a couple of kilometres down Butler. And be sure to visit the falls on the same drive. Devonport is the closest big city. Sitting just 117 kilometres away, the drive takes about 1.5 hours. Launceston is 2 hours and 45 minutes from the lookout. The inland city sits 207 kilometres to the east. Hobart is 396 kilometres away and that drive will take you nearly 5 hours. The viewing platform is safe but you should always be careful near steep drop-offs. Keep an eye on children.